Compared to regular marijuana seeds the plants produced from the series of autoflowering cannabis seeds are able to skip the slow blooming cycle and begin this phase within a timeframe of four to six weeks after germination; irrespective of the quality of light received. Once a further four to six weeks is passed, these plants are again ready for producing a fresh harvest. A quick growth cycle means it is possible to enjoy a quality harvest three to five times per season. It is suggested that the harvest starts once a significant portion (up to 75%) of the white hairs begin to change brown/orange and at a stage of the trichomes reaching the desired colour. 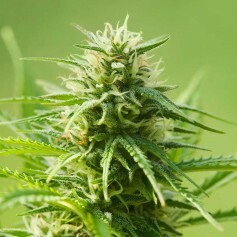 An autoflower cannabis plant is likely to exist in a variety of different species, each of these offering its distinct flavour and characteristics. A quality section of seeds includes the Super Skunk, White Widow, Big Bud, and Lowryder. A delicious outcome is certain to be experienced with each of these mentioned strains. A germinated plant can be replanted in a large pot which is likely to remain home for the harvest, a large sized pot is certain to help with providing the more desirable yield. Our autoflowers come as the feminized seeds and perfect for the growers with limited space or less experience. All our Autoflowering seeds are feminized. Buy best autoflowering marijuana seeds | Autoflowering cannabis seeds - High Supplies Buy the best autoflowering marijuana seeds for autoflower plants and cultivating. We guarantee high quality seeds. Visit High-Supplies.com and profit now from our low prices.